Morro Bay, CA—Make that guerrilla social worker, and I’ll explain in a minute. Taylor Newton, the hung-ho executive director, doing his “motivating them” pep talk which is standard at the Monday evening dinner meeting. clipped severely right up the sides. Has tattoos and loves them. Is invariably garbed in tight jeans and chest-hugging work shirt. If I were a movie director casting for a tough Marine drill sergeant, I’d pick Taylor in a minute. You’d hardly think he’s a scientist by background. But he is, very definitely. A graduate of tough CalPoly with a major in soil and agricultural science. Did grad work at Rutgers University. Then sailed around the Pacific on a scientific mission to map phytoplankton populations. Followed this up with several jobs in the high-tech world. “I decided didn’t want to become a career scientist. The real me came out. Gradually I became what I am now. 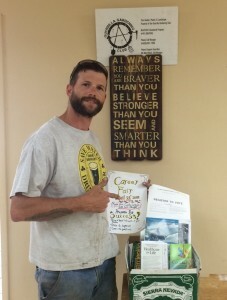 So he came back to central California and launched what he called the Guerrilla Gardening Club. That was 6 years ago. He’s worked hard and made the GGC the success he wanted it to become. 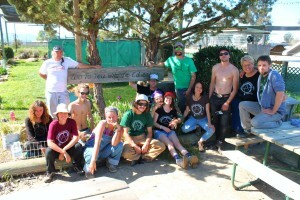 The Guerrilla Gardening Club is an unusual non-profit. Organized per and licensed by the State of California with bylaws and a board of directors, of course. He is not only GGC’s founder. He is its executive director and guiding spirit. It does more than grow things. It grows character and ambition in young “street wise” men and women. Justin and Austin selling a customer a beauty in the Guerrilla Garden Club’s nursery at St. Timothy’s Church. Both have found a new and so much better life by applying themselves in the club. Street wise meaning what? Well, some are school drop-outs. Some have no family and may be homeless. May be on the move from one place to another. Some don’t fit into our society and may want it that away. Others may resent that they are outside rather than inside. And some–who knows?–may be on the lam. And for some, alcohol and drug abuse may fit into the picture. They join willingly, as volunteers. No papers to show or sign or anything like that. Taylor will help them with food and shelter and clothing, as needed, but they must agree to work under his tutelage. Let’s make that, will learn to work. He calls it “learning by doing.” No textbooks. No lectures. They’ll learn by building up experience day by day. Much of the work will be gardening. Learning to grow things for both food and ornamentation. But it may also come from cleaning windows and floors professionally, and that’s emphasized, professionally. And from taking orders from a boss (him), showing responsibility by showing up every day on time and not killing time on the job, and by finishing what he or she agrees to undertake. Right now he has some 125 active members. Every Monday evening, at St. Timothy’s Catholic Church here, they come in for a mandatory evening together. They’ll sit down to a fine and filling buffet dinner. With seconds. Prepared from hand-outs from a couple of area food banks. Right afterward, still in their seats at the table, they’ll swing into the “talk part” of the session. 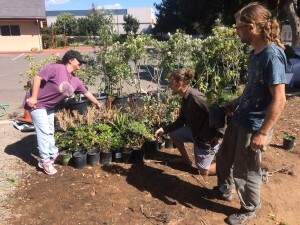 Club members turned out for a volunteer landscape renovation project at the Zoo to You Park in nearby Paso Robles. They learn to get good at gardening by working hard. And to give of themselves. All while making like-minded friends and developing a sense of community. than you believe, stronger than you seem, and smarter than you think!” –Winnie the Pooh. Taylor, who is still in his work clothes and was dining with them a few minutes ago, will stride to the front and get things started. Everybody will adjust their chairs to face him. They know what’s coming up– a pep talk. It may last two hours. Sometimes longer. His message will be simple and direct. And there will be two or three other people, mature, unpaid, successful in life, volunteers in a different way, who will stand and give counsel and advice from their own hard-earned experience. Practical stuff. Nothing high-falluting about it. For Taylor, what the evening is all about is super-charging his listeners. Getting them to see the value and importance of all this. Seeing that this will be life-changing—IF they are serious about it. Meaning if they’re not here just to free-load and hang out with new friends. At first they’ll be volunteers. No paychecks. Once they develop a bit of skill, they’ll get paid work, which he will find. His hope is that they will “graduate” to a job out in the real world finally. Become self-supporting and keep growing, establishing themselves as good citizens and neighbors. And this is why though Taylor has no degree in social science, I call him a genuine social worker. Now about the Guerrilla part. In truth, the word bothered me. It suggested undercover fighting by committed but loosely trained citizen soldiers. No uniforms. Carrying whatever weapons they can come by. Think Vietnam and Cambodia. Turns out that I’m not up to date. I found a new definition in the dictionary and specific to gardening.–“Guerrilla gardening involves activists planting seeds on abandoned or public land, usually in secret. “ That was quite a surprise. To Taylor’s way of thinking, it means planting seeds and often plants on any unused piece of land, public or private, for the purpose of making it look better and provide a valuable crop. Sometimes with permission, sometimes without. And that’s what he and his club members do.. He can rattle off a long list of places where they’ve taken that initiative. A few examples: the Morro Bay Police Station, Community Center, Library, City Hall. Also Centennial Park. And numerous other parks, streets, and corners. Nobody knows when or where he’ll show up with his gang next. On a Monday 40 to 60 might attend. I’ve been there three times, just to see all this for myself. One of Taylor’s other goals is to “build community.” Be part of a good, solid social group. I see it happening. I’ve observed them in groups big and small out in the yard d before dinner, and out there again after the meeting. Playing Frisbee. Jumping rope or hula-hooping. They have fun together. Like one another. Are making friends. maybe for the first time. Why at St. Timothy’s Church, which to all appearances is a lovely, thriving parish? He has a contract to maintain its buildings and grounds. As part of the deal, he is permitted to hold his meetings in the parish hall and use its kitchen and dining room. He puts some of his members to work here, but learning how to do everything “professionally,” and not all of it is gardening. A part of it is washing floors or windows, maintaining the manicured grounds, or preparing the church for its masses and rituals. The point is to tackle whatever they’re assigned to, and pleasantly. He also has a full plant nursery here, with a wide variety. Many of the plants are potted and ready to be purchased. He told me this revenue goes to the church..
What is important is that this is the “lab” where his charges learn how to properly grow things and gradually build up their skill and pride. Certainly he’s come up with a few failures among his members over the years. Some who haven’t responded…have never gotten the message….have been a drag on the others. Three or four have had to be asked to leave. From what I can see, people think highly of him and his work. He was my guest recently on my Saturday radio show, “Gabbing with old guy John,” on 97.3 FM, Morro Bay–“The Rock,” as the station calls itself. He did a great job. Quick, lively, enthusiastic, fielding all my questions. You can see I admire what Taylor is doing. But I still think he should come up with a better name. How about “The Gung Ho Gardening Club”? Or “The Very Different Garden Club”? You readers have the idea now. What would you suggest to him?